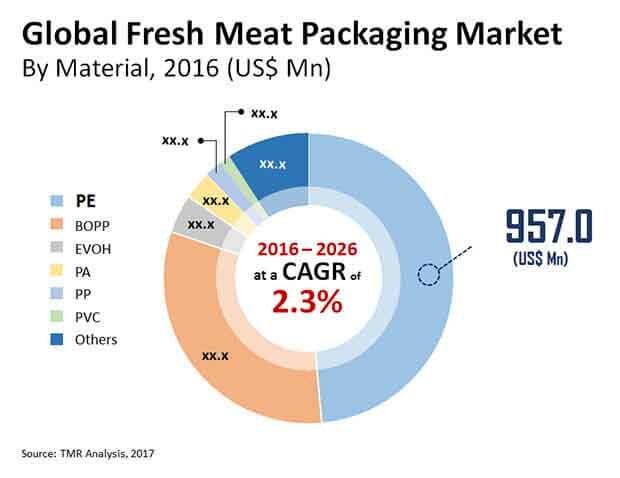 The global market for fresh meat packaging has witnessed an impressive rise over the last few years, thanks to the increased shelf-life of the meat products, a growing demand for customization in meat films by meat producers, and the benefits of flexible film packaging over rigid packaging. With various beneficial characteristics of fresh meat packaging, such as low carbon footprint, reduced energy consumption, decreased raw material consumption, and low wastage, this market is likely to continue its growth trajectory over the next few years. Apart from this, the increasing rate of urbanization in emerging regions, such as Asia Pacific and Latin America, is also projected to cause a massive shift towards the preference for packaged food among consumers, further stimulating the market. In 2015, the overall opportunity in this market was US$1.92 bn. Rising at a CAGR of 2.30% between 2016 and 2026, it is likely to reach US$2.47 bn by the end of 2026. A number of lucrative opportunities for players operating in the market are expected to arise in the near future, especially in the Asia Pacific region. Modified atmosphere packaging (MAP), vacuum skin packaging (VSP), and vacuum thermoformed packaging (VTP) are the key technology types used in fresh meat packaging. Among these, VSP technology enjoys a significantly high popularity among consumers. Its popularity graph is anticipated to continue increasing over the next few years, resulting in the segment’s lead with a share of 32% by the end of 2026. The main types of materials used in fresh meat packaging are PE, PP, BOPP, EVOH, PVC, and PA. The PE segment has been leading the global fresh meat packaging market currently and is expected to remain doing so over the forthcoming years, thanks to a number of factors, such as lower cost of production as compared to other materials and the elasticity. North America, Latin America, Eastern Europe, Western Europe, the Middle East and Africa, Asia Pacific Excluding Japan, and Japan are the predominant regional markets for fresh meat packaging across the world. North America, among these, holds the dominant share of this market at present and is expected to continue to do so over the next few years on the ground of early adoption of fresh meat packaging among meat producers. The North America fresh meat packaging market held more than 36% of this market in 2015. This regional market is projected to gain considerably in the years to come from the increased research and development activities, boosted by the mounting investments. Asia Pacific excluding Japan is also expected to witness a substantially high growth over the forthcoming years. The rapid industrialization in this region is likely to boost the Asia Pacific market for fresh meat packaging in the near future. Alongside, the increasing investments by companies for research and development in this field in Asia Pacific is also anticipated to propel this regional market over the next few years. Amcor Ltd., Dupont, Bemis Co. Inc., Berry Plastic Group, Winpack Ltd., Sealed Air Corp., Crown Holdings, Reynolds Group, Coveris Holdings S.A., and Sealpac International BV are some of the key companies involved in the business of meat packaging across the world. Market numbers have been estimated based on data available from Food and Agricultural Organization (FAO) website, and extensive secondary and primary research, average pricing of fresh meat by material type and the revenue is derived through regional pricing trends. Market size and forecast for each segment have been provided in the context of global and regional markets. The fresh meat packaging market has been analyzed based on expected demand. Prices considered for the calculation of revenue are average regional prices obtained through primary quotes from numerous regional fresh meat manufacturers, suppliers, and distributors. All key end users have been considered and potential applications have been estimated on the basis of secondary sources and feedback from primary respondents. Country demand patterns have been considered while estimating the market for various end users of fresh meat in the different regions. Top-down approach has been used to estimate the fresh meat packaging market by regions. Global market numbers by packaging technology type, material type and meat type have been derived using the bottom-up approach, which is cumulative of each country’s demand. Company-level market share has been derived on the basis of revenues reported by key manufacturers. The market has been forecast based on constant currency rates. A number of primary and secondary sources were consulted during the course of the study. Secondary sources include Factiva, FAO, Packaging Digest, and Hoover’s, and company annual reports and publications.